Chef John Fleer sits on an overturned bucket outside the kitchen door, scribbling notes about the night's menu. The James Beard Award finalist was up at 5 a.m. stoking the coals for ember-roasted kabocha squash. Now in his 10th hour of preparations-- that's not counting the two previous days of work this is one of the few moments he'll pause before sending out a feast for 150. Next to him, the turkey fryer is at a roiling boil, crisping the sorghum-glazed pork belly chicharróns that will add a salty crunch to baby collard wraps. Inside, the small kitchen is a hive of activity with nearly a dozen chefs buzzing about chopping, shucking, stirring, and stuffing. A sweet corn risotto, which will be paired with pork cheek from Eden Farms, simmers on the stove. And the coveted oysters from Stump Sound are the topic of much conversation. In all, 25 delicious creations, some merely one exquisitely crafted bite, make up this dinner that has been months in the making. the guests were clued in on were the theme, Preserve, and that the lauded chef of Canyon Kitchen in Cashiers would be creating the menu. 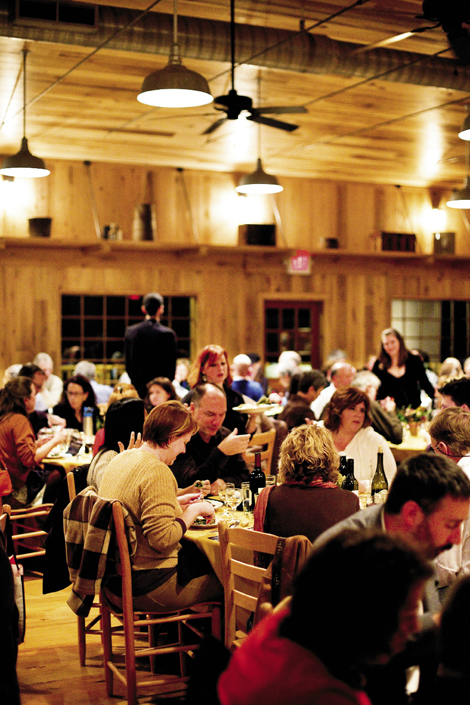 Therein lies the novelty of Blind Pig, Asheville’s underground supper club. Secret eating societies first became popular in the 1920s on the West Coast. Thanks to our recent love affair with local fare, they’re making a comeback in food-centric cities across the country—from Portland, Oregon, to New York City, and now here. Created by Mike Moore, co-owner and chef at Seven Sows Bourbon & Larder, and his wife, Darlene, a designer and account executive at Clear Channel Radio, Blind Pig presented its first underground supper in July 2011 at The Admiral. The sold-out fête, themed Carnivore, brought exotic meats to the table, including snapping turtle, beaver, and feral pig. “It was a shot in the dark,” admits Mike, who was then a chef at the West Asheville restaurant. “We didn’t expect it to go past the first dinner.” The inspiration came from a supper club event Mike attended while living in San Francisco. The monthly dinners are hosted at unexpected locations and feature guest chefs who create menus around elaborate themes, from a Beatles Yellow Submarine soiree to an interpretation of Dante’s Divine Comedy. At a Groundhog Day dinner more than a few Bill Murray look-alikes dined on Punxsutawney Phil’s kin in the Caddy Shack barbecue sliders. Fire & Chocolate brought Ethiopian cuisine tinged with French Broad Chocolate plus African drumming and a fireworks display prepared by chef and pyrotechnics enthusiast Mark Rosenstein. And The Offal Experience put odds, ends, and organs on the table for the true culinary adventurers. Still, the suppers aren’t just palate-pleasing parties for intrepid diners; chefs jump at the opportunity for artistic expression and to share in the camaraderie. The chance to be part of an acclaimed chef’s culinary explorations brings diners back time and again. These days, the coveted tickets can sell out in a matter of hours, making a sport of scoring a seat at the table. In part, the success is fueled by a philanthropic mission for each event. Most of the cooks and servers are volunteers, but beyond the costs for the venue and food, a percentage of the proceeds benefit local charities, ranging from the March of Dimes and MANNA FoodBank to The Preservation Society of Asheville & Buncombe County. Each organization gets to share its mission with the guests. “Giving the nonprofits an opportunity to speak and educate 80 or so folks about what they do, it goes a long way,” Mike says. The demand for Blind Pig spurred the couple to start an offshoot business, Snout Catering, which launched last fall. Unlike traditional catering outfits that offer prix fixe menus, the Moores’ venture is highly individualized. For one wedding, Mike and Darlene gathered background info on the couple, and then created a menu and thematic experience that paid homage to their lives. Lobster pot pies were served as a nod to family ties in Maine. A dessert incorporated energy bars to represent the bride and groom’s love of athletic pursuits. The Moores have also managed to find time to produce a quarterly gastronomic publication, Underbelly, while launching a restaurant on Biltmore Avenue. Seven Sows Bourbon & Larder offers a modern take on nostalgic Southern Appalachian cuisine, as well as a collection of fine bourbons and cocktails. For Preserve, guests are shuttled in via tractor-drawn wagon to Yesterday’s Spaces, an event barn at Gaining Ground Farm in Leicester. Fleer, Mike, and the staff are ready. Diners mingle and nosh on an array of hors d’oeuvres, from pimento cheese hush puppies to pickled quail eggs and duck prosciutto, while the band cranks out Americana tunes. Pisgah Brewing Company is on hand serving its limited release Benton’s Bacon Stout, created for this dinner using 100 pounds of rendered bacon fat from Alan Benton’s farm in East Tennessee. The crowd settles in with bags of bacon-brown sugar popcorn and bourbon barrel-smoked paprika fried hominy, a fun twist on old-fashioned corn nuts, to watch a screening of Preserve, a documentary Mike produced. The film highlights Appalachian heritage farms, including Benton’s, Gaining Ground, and Cruze Dairy. It’s a special evening, as many of the farmers responsible for the featured ingredients are guests of honor. And with many more bold culinaryexperiences on the horizon, it seems Blind Pig might just make foodies of us all.